Photo by: Georgia SparlingNon-perishable food donated by students bows a table at Center School. MATTAPOISETT — Throughout the school year, the health offices at Center School and Old Hammondtown School urged students to “help can hunger.” And by May, the students from preschool to sixth grade had collected 1,700 non-perishable food items to donate to a local food pantry. In May, Assistant Principal Kevin Tavares upped the ante with a challenge of his own. Tavares took the winnings from his staff’s healthy eating challenge and bought 480 items to donate to the food pantry. Then, he gave the kids a dare they couldn’t quite pass up. “I told them if they could bring in one more can than I did, I would spend the night on the roof of Center School,” explained Tavares. Called “Mr. T’s Challenge,” students had from June 1 to 17 to bring in food items. They matched Tavares’ donation and then almost doubled it. On Monday, June 15, the students had donated almost 800 cans. “I’d say it was successful,” Tavares said. On July 18 he plans to get on Center School’s roof and stay there until the following morning. Tavares said he hopes friends, family and parents will continue to donate cans while he settles in on the eaves. Beth Oleson, a member of the schools’ health office, said the year-long can drive has been a positive one for students. “The kids have really learned and been engaged in this community project – from bringing in to collecting, to sorting and checking expiration dates. There’s been school-wide support,” she said. For his part, Tavares is glad to see the students rise to his challenge, and he doesn’t mind spending a night on the roof for a good cause … though if anyone has a small tent he could use, give him a call. “It’ll be fun,” he said. And he hopes to get a few hours of sleep so he can be chipper for the sixth grade graduation the following morning. Parents of high school students have reason to celebrate: The cost of prom is going down. A nationwide survey conducted by Visafound that the average American household will spend $919 on high school’s most storied night — a 6 percent decrease from last year. According to Visa’s findings, the pomp and circumstance of the promposal is on the rise. At least one third of the annual cost of prom — about $324 — will be spent on securing a date to the big dance, according to Visa. “Prom is a fun night for the kids to get together and dance, but spending $300 plus on a promposal to simply ask your date is exorbitant,” said Nat Sillin, Visa’s head of U.S. Financial Education. Promposal — a combination of the words “prom” and “proposal” — is the term used to describe an over-the-top, public invitation to the prom, which mimics a marriage proposal. It can range from a candlelight invite to choreographed YouTube performance. 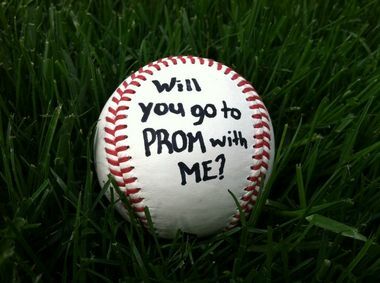 Promposals date back to the early 2000s but have become a common part of the prom lexicon in recent years, with pictures and videos of the invitations flooding Instagram and Twitter. In addition to noting how exorbitant one teenage trend has become, Visa’s annual survey also highlighted regional and economic disparities with the big night. The Northeast, for example, leads the nation in prom spending. Northeastern families are likely to spend an average of $738 for most prom-related expenses and about $431 on promposals, creating a tab of $1,169. Midwestern families meanwhile continue to be the most thrifty. They will spend an average of $515 on prom night and $218 for the promposal, leading to overall expenses of $733. New Jerseyans tend to spend more due to population density in suburban areas and a higher cost of living compared to other parts of the country, Sillin said. Graw suggests students take advantage of closeout offers from retailers’ overstock stores including Nordstrom Rack and Neiman Marcus Last Call and said websites such as Groupon.com and Livingsocial.com often have limousine deals. “An alternative to limo rentals would be contacting a friend or family member who owns a luxury car and asking if they’ll be your transportation for less than what a limo would cost or, if you’re lucky, even free,” Graw said. A recurring, and perhaps alarming, economic trend is that those with less are spending more. Visa found that families with lower incomes are expected to outspend their more affluent neighbors when it comes to overall prom costs. The Visa survey reported households with annual incomes below $25,000 will likely spend about $1,400 on prom, while families with an annual income less than $50,000 should spend little more than $1,100. This disparity is a recurring trend, Sillin said. To avoid a dance with debt, he suggests parents treat prom as a teachable moment. “Prom heightens the importance of parents using this as an opportunity to set a budget and manage that budget with their teens,” he said. Regardless of economic status, Visa’s survey found that parents — not the prom attendees — will bear the financial burden of prom. Last year, parents planned to pay for 56 percent of prom costs. This year, that number has climbed to 73 percent. With parents willing to subsidize such a staggering amount, there is no incentive for teens to cut costs, Visa’s survey suggests. Old Rochester Regional High School: Tuesday, June 2, 2015 at the Villa in East Bridgewater.